Shock Me! Thrill me! Dot Matrix Me! The resolution on this is actually higher than the camera could capture. If you've been in the shop in the last few months, you may have noticed little lasered Tesla photos floating around. We got a bug in our ear about using the lasers as dot matrix printers, and considering the Little Blue Laser is 600 DPI, I couldn't rest until I got a really flawless grayscale effect. I know what you're thinking: What is this sorcery, and how do I make it mine? Blood, sweat, and sacrifices to our robot deities. The first step is to convert your grayscale image into a dot matrix. Photoshop has a highly customizable tool for this (Filter > Pixelate > Color Halftone), or you can just use Rasterbator. If you use Photoshop (or anything that gives you a raster/bitmap output) the next step is to get an accurate vector tracing of that file without breaking your vector program. If you use Rasterbator (which spits out vector PDFs), you have to fuse any overlapping dots. Why? Because if the laser's engrave setting will assume that the overlapping parts are not to be lasered out-- so you end up with an image full of static. Fritz Rodriguez opted to swear at the file himself. For him, the lasercut was just the first step. He then photographed and printed the burned, woodsy version of this image of flowers, which is a royalty-free patent illustration. Here's a close-up. Fritz is an art student, but he didn't make this for a class-- just to see if he could. I've crashed both Inkscape and Illustrator many times trying to get beautiful, hi-res Teslas. I've uploaded what I thought were perfect files only to find that the laser sees a scribble instead of a dreamy inventor, or inverts the dark information into white. So if you want to laser out a dot matrix image of your very own, bring your computer into the shop and plan to spend a few hours swearing at it, or take advantage of our very reasonable design/labor fees. 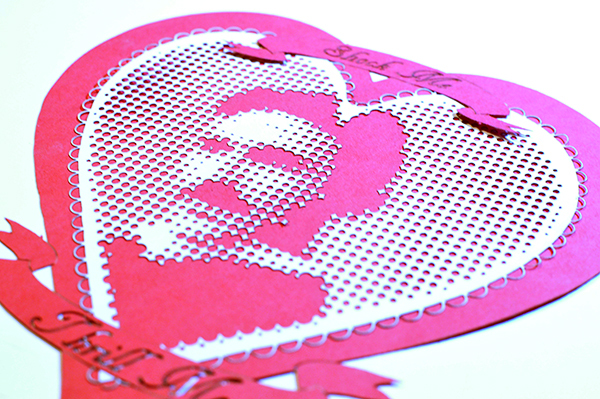 In the spirit of the Hallmark Holiday, I've been cooking up a Tesla doily valentine. Here's the first iteration. I'm thinking about doing a whole set of them-- imagine Hedy Lamarr with "Call me. Text me. Email me. Chat me." around her head. What do you think? If I make a whole set of Science Dreamboats, who can't you live without? To find out more about preparing images for the laser, check out the Inkscape class this upcoming Tuesday 1/14/14, from 7pm to 9pm. Call ahead to reserve a space.